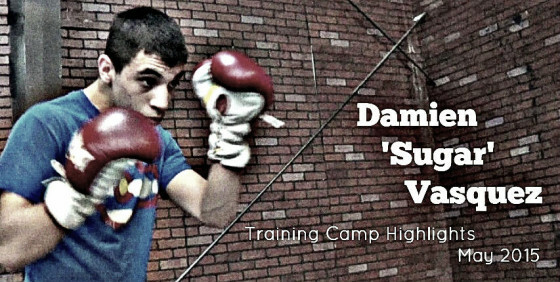 Hustle Boss caught up with rising talent Damien ‘Sugar’ Vasquez recently inside of the Top Rank Gym out in Las Vegas. Vasquez (7-0, 3 KO’s), who just recently turned 18 years old, is coming off of the first defense of his NABF junior flyweight, as he pounded out an eight-round unanimous decision victory over Edwin Reyes, a man ten years his senior, on March 14 at Sam Town’s Hotel and Casino. The Denver, Colo. native is now lined up with a looming date in June against 65-fight Mexican veteran Lorenzo Trejo. The match is on tap to take place in Detroit and Vasquez is already deep into training camp. Under the guidance of the respected vets Ismael Salas and Miguel Diaz, Vasquez is now often training alongside stable mates Jorge Linares (WBC lightweight champion) and Rances Barthelemy (Former IBF junior lightweight champion) as he continues to get more seasoned before looking for a statement run as a young professional. How far can this kid go? His father Oscar Vasquez sees a fight with Roman ‘Chocalatito’ Gonzalez as a realistic possibility in two years’ time. Check below for more of Team Vasquez as camp continues to push forward.